These two routes first intersected in 1945, when TX 6 was extended. Another result of that extension was that TX 6 became the longest state highway in Texas for the next 20 years, until TX 16 assumed that honor in 1965. The history of the changes that led to the current arrangement is largely a story of renumberings due to conflicts with US route numbers in Texas. On the 1935 official state highway map (the earliest I have seen), TX 6 began in the Galveston area (as it still does) and ran northwest, but it ended in Waco. At the time, the road running northwest out of Waco through De Leon was TX 67. Meanwhile, TX 16 was quite different than today's routing. It began in Falfurrias, running up to San Antonio via an indirect route through Corpus. The route of today's TX 16 northwest from San Antonio to De Leon was designated TX 81. The US 81 designation was established in Texas in 1927, and US 67 was extended southwest of Dallas by 1930. Both of those routes intersected the state highway of the same number (US 81/TX 81 in San Antonio, and US 67/TX 67 in Dublin, just down the road from De Leon). Incidentally, note that TX 67 did not use Navarro Street on the west side of town. Rather, traffic came in on Bivar Street, junctioning TX 16 at Fannin Street before stair-stepping up to Navarro. It should also be noted that TXDoT's 1939 description of TX 16 had it ending north of Del Leon, at the Possum Kingdom dam. However, the road between De Leon and Strawn was not constructed until the 1950s. So if TX 16 was actually signposted north of De Leon, then it must have used a temporary routing along TX 67 through Eastland. In 1945, the US 67/TX 67 junction in Dublin was eliminated: the TX 6 designation was extended northwest from Waco, replacing TX 67 all the way to Breckenridge, and then continuing almost to Throckmorton. This increased the total length of TX 6 to over 420 miles, causing it to surpass TX 36 (at 392 miles) as the longest state highway. 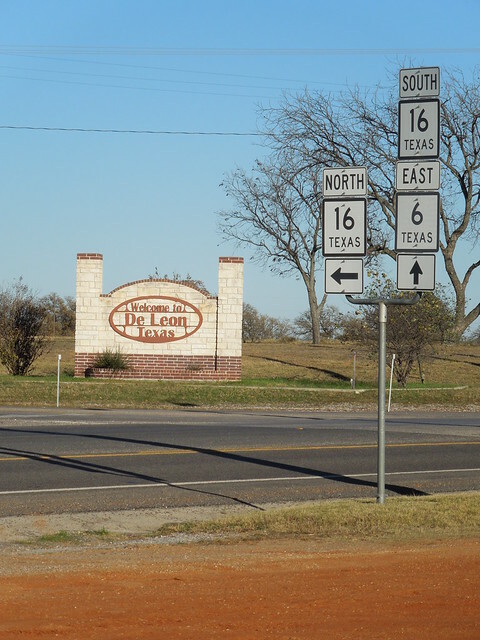 That also became the first time that TX 6 and TX 16 shared a junction, but at the time TX 16 was the third-longest state highway. It became the longest 20 years later: in 1965, TX 16 was extended south from San Antonio to its current terminus in Zapata, increasing its length to over 500 miles. After another four years it was extended north to its existing terminus near Windthorst, thus attaining its current length. In 1975, TX 6 was extended north to its current terminus at the Oklahoma line (along what had been TX 283, which was eliminated because of a conflict with the nearby US route of the same number). *These mileages do not match the figures listed on the corresponding Wikipedia pages. I did the measurements manually, and I believe Wiki is in error. I suspect the TXDoT source cited by Wiki editors does not take all concurrencies into account.